Before going further let me tell you something about Shimoga’s history. Shimoga (aka Shivamogga) is the head quarters of Shimoga district and located on the banks of Tunga River in Karnataka. According to some historians this district is probably the southern end of Ashoka's Maurayn Empire. Shimoga saw the reign of many kings and dynasties like Kadambas (4th century), Chalukyas (6th century), Gangas, Rashtrakutas (8th century), Hoysalas (11th century), Vijayanagara (15th century), Kheldi Nayakas (Shivappa Nayaka is considered as the prominent of Kheldi Nayakas) and then the region came under Mysore kings, and later in 1947 integrated with Union Of India. After a long journey from Sagar, bus reached Shimoga bus stand. Here both private and KSRTC terminals are close to each other. My first job was to find Durga hotel, where I am planning to spend the night. With a map in hand, it was not a difficult task. After having bath, I left the room to roam around. After walking for a while, I suddenly remembered about Shivappa Nayaka Palace. Why don’t go there? Well this time, map didn’t prove much useful. I went through the road following the map, but the palace was nowhere in sight. After checking with a lot of people and walking for half an hour I reached in front of palace gate - only to see the locks. I checked my watch once again - it’s not even 5 ‘o’ clock (and Saturday is not a holiday for ASI museums). Then why? I was told to come again on next day. Slowly I started walking back to the main road. Music was coming from various Ganesh idols planted close to the roads; people from Jain community were assembled in a building and various cultural programs were going on there; in between I saw a small road going towards the river. People were sitting on the banks and engaged in fishing; couple of minutes there as well. Bhadra River originates from Gangamoola near Kudremukha - located in beautiful Western Ghats. Various tributaries will join the river before it reaches Lakkavalli. A big dam is built in Lakhavalli forming a huge reservoir behind it. From Lakhanvalli river continues her journey and cross Bhadravathi city. In Koodli she will shed her identity and join with Tunga to form Tungabhadra. Tungabadra will later join with Krishna (close to Alampur near Kurnool, Andra Pradesh) and finally find salvation in Bay of Bengal. One can see the dam from road itself. I opened the rusted gates slowly and walked in. White water was coming out of dam’s two slightly opened crest gates. After checking with security guard, I took the steps on my right to reach the top - only to see another closed gate. There was a small opening, covered by bushes and trees. I walked slowly through that slippery path, which led me right in to the waters. From there, I could see various small islands popping their head out of the water; painted their body in green colour. At one end, there was a small bridge connecting an island to mainland. Gate was opened for visitors by the time I came back. I had to put the camera inside as the visitors were not allowed to take photos. The reality is, a lot of people were taking photos using mobile phones (which were stopped later by the guards). I don’t understand this concept. Now-a-days cameras on many high end phones are comparable to that of entry level DSLRs. Moreover, all these information is available through net – Google earth etc. Then why authorities want to restrict only cameras? I walked to the other side, curiously looking at the mapping instrument, mechanism to open the crest gate, crest gate etc. The second one is mammoth equipment imported from Germany!!! On the other side, pure water drops in white colour is jumping out of the slightly opened crest gates and touching the ground. After spending some more time on the top I left for Shimoga. Interestingly, I got the same bus I came in. My next destination was Tunga – Badra sangam at Kodli. From Shimoga stand I got a bus, which is passing around 2km away from Koodli (15 INR from Shimoga stand). After a while, I got down at the stop and started walking through that old and tired road dotted with holes. Here I met Sheik. He is in his early teens, dropped from school and working in a shop in the city. He was good in Hindi; I would rather say Urdu. Both sides of road were devoid of any human presence. Talking about various things – Koodli, Shimoga, Gulf countries etc - we walked forward. When we reached his village, he showed me the way to go forward and ran to his hom for late lunch. Pot holed road gave her way to concrete ones. Soon after crossing the famous Sangameshwara Temple I reached the Sangam. Some 15-20 people were either standing or sitting in the steps. After removing the shoes, I went in. A family was doing some poojas for salvation of their forefathers. I walked towards the tip and looked straight to the Sangam. Tunga River on my left; Badra on my right; joining at this point and forming Tungabadra in front of me and then flowing away in search of salvation, carrying the prayers of many others. After a while I left the Sangam and went in an auto (which later proved a costly mistake) to bus stop. 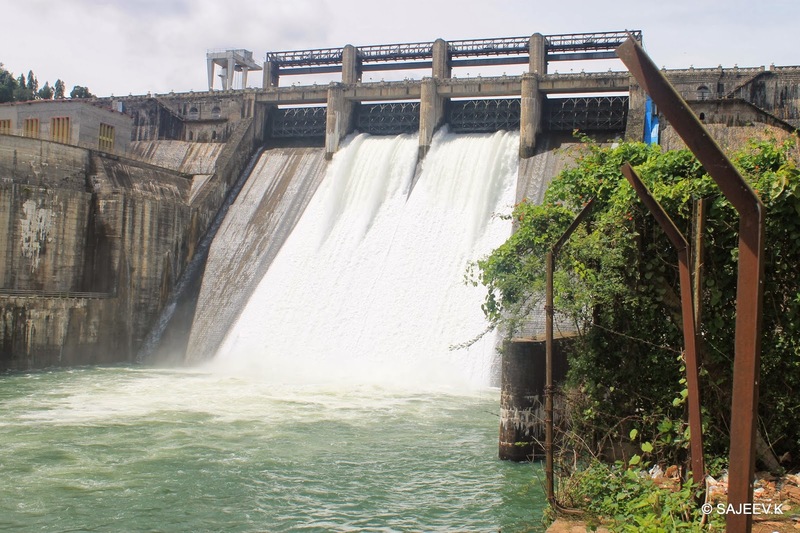 Gajanur Dam is located some 14kms away on the sides of Shimoga-Thirthahalli road. Buses to Tunga Dam start from a bus stop close to the stand. I went there and boarded a bus. After a while bus took a sudden right turn and moved to a small road. That road was so small that, branches of trees from both side were sometimes blocking the way. What if any vehicle came in opposite direction? Forget about another bus, there was not enough space even for an auto. It looked more like a wild elephant running through a sugarcane plantation. Not a single bus came opposite to us. Would I stick in Gajanur for the whole night? In this journey I met Somashekhar. He studies in a school close to dam. He explained me that, it’s a short cut to reach Tunga quickly!!! I didn’t think we were running late, then why on earth a private bus want to take a shortcut reach the destination? After a while we got down at Tunga river project. This dam is still under construction. With 16 crest gates this dam structure is big compared to just 4 gates of Badra. However the reservoir formed by Tunga is much smaller than that of Badra. By the way ‘Sakrebailu’ elephant camp is located on the next stop. If you get time don’t forget to go there. Somashekhar and I undertook a long walk to get a full view of Tunga Dam; finally we got a view point. I felt like he was also reaching that point for the first time. After spending some more time there, I told good bye to Somashakhar and boarded a bus back to Shimoga. By the time I reached the city, colour of western horizon change from Orange Red to whitish black. Shimoga is also famous for ‘Mysore Paks’. Earlier Sahil asked me to try in ‘Venkateshwara Sweet House’ for sweets. It took a while for me to find it out. They gave me a very hot piece as sample. It was really good, one of the best piece I ever had. After buying sweets and having ‘Pani-Poori’, ‘Masala-Poori’ and ‘Masala Dosa’ on the way to bus stand; I finally sat in a chair waiting for my bus to come in. NH 206 connects Bangalore with Shivamogga (274km). This road passes through Tumkur, Arsikere, Banavara, Kadur, Birur, Tarikere, and Bhadravathi. KSRTC operates a lot of services in this route. Shimoga is accessible from Sringeri, Dharmastala, Hubli, Agumbe as well. Shimoga is connected to Bangalore and Mysore directly. For those who come from other states try nearby rail junctions like Birur Jn etc. Shimoga airport is still under construction. Try Bangalore airport and take a bus or train.